The Cyr post did not specify how long the tests were (and that can make a big difference if you’re looking at times under an hour–see this time comparison). The Cyr post did not describe the particle counter or particle size. But now I finally have directly comparable data! That’s because two kind souls donated a Blue Air 203/270E (3,600 RMB) and a Philips AC4072 (3, 000 RMB). That means I could finally test the DIY against expensive brands in the same room, for the same amount of time, with the same particle counter. The Cannon removed as much particulate as the expensive machines. Not bad for 450 RMB! Yet all four filters were making the room air significantly cleaner. 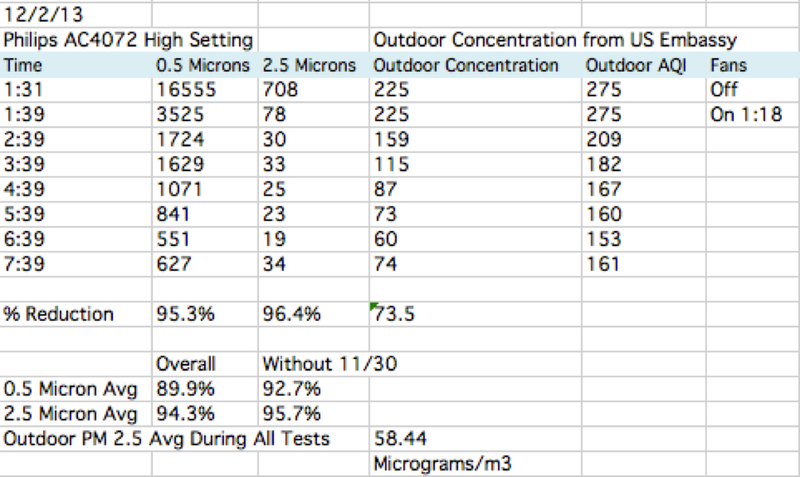 For particles 2.5 microns and above, all four removed over 90%. 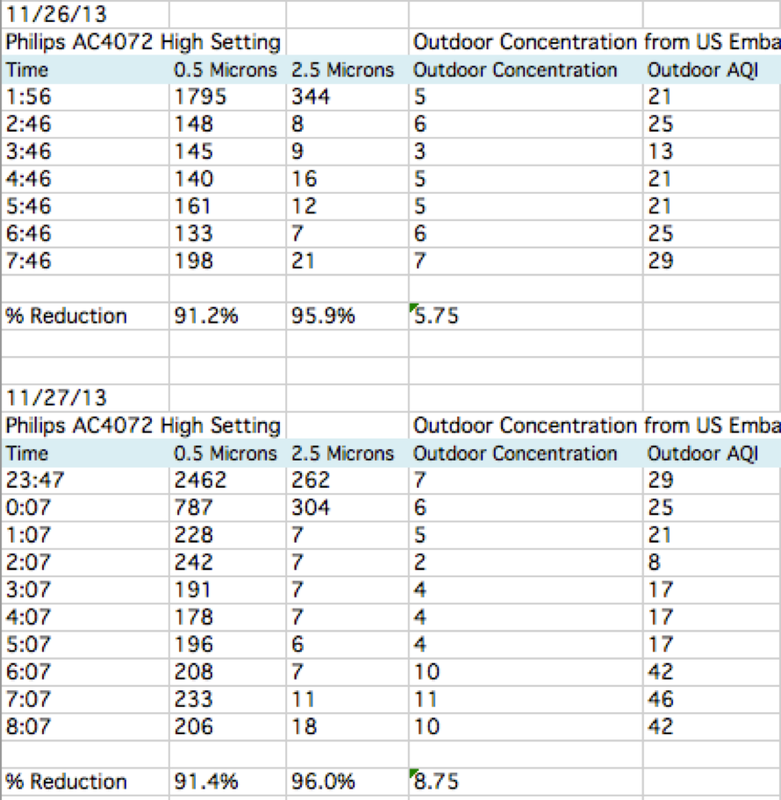 For particles 0.5 microns and bigger, all four removed over 80%. I’m not the first person to say: All you need to significantly reduce the particulate pollution in your home is a simple HEPA filter. 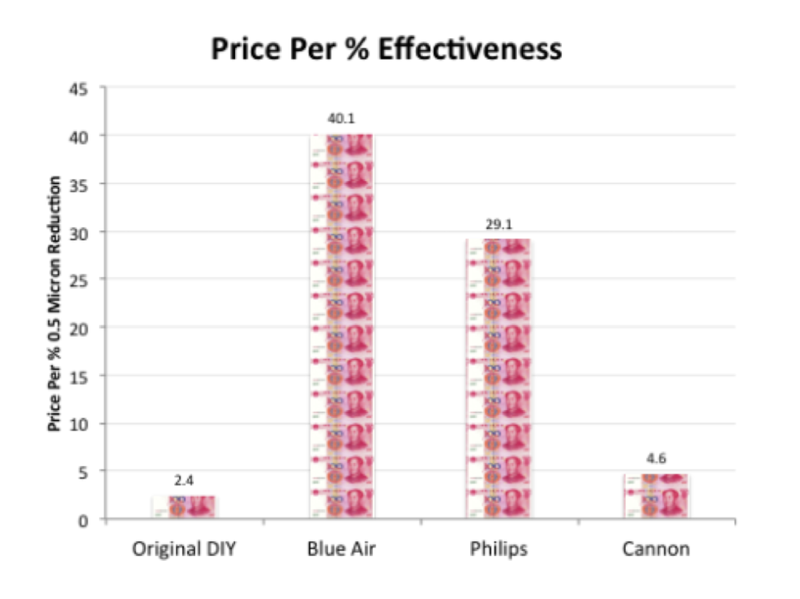 Recently, a Chinese news article claimed air filter companies are making “falsely inflated profits.” That fits with this data showing that the Cannon removes more particulates than the Blueair, yet costs 1/10th per percentage of 0.5 micron reduction. 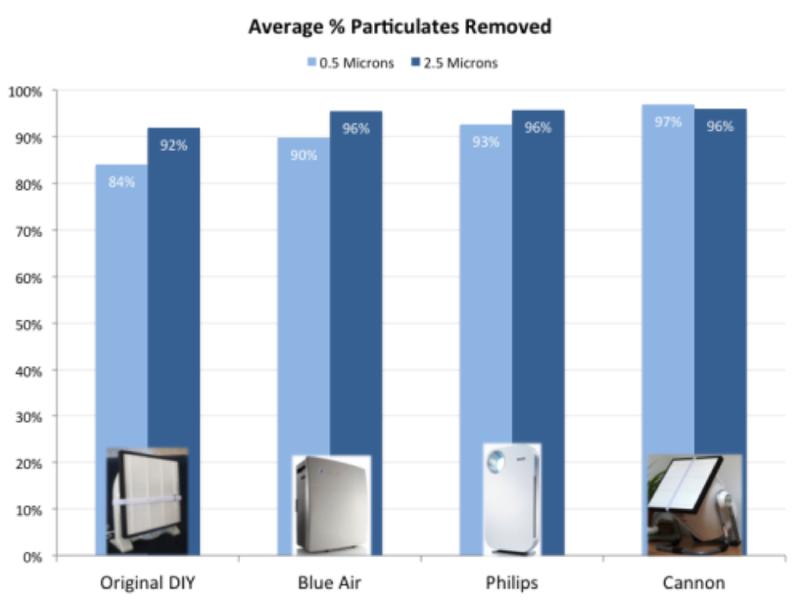 Similarly, the original DIY removes 4% less 2.5 micron particulate and 6% less 0.5 micron particulate than the Blueair on average, yet the Blue Air costs more than 16 times as much. You can remove particulate pollution from the air in your home and pay far less than a Blueair or Philips. Now, as I’ve said before, particulates are not everything. There are also gases like radon and carbon monoxide (although I’m less concerned about those). People who suspect that their homes may have harmful gases (particularly people whose homes are being remodeled) can get home tests done for gases from Pure Living China. It’s not cheap, but I’d consider it if I had a baby at home. As always, I’m posting the original data and detailed methods for fellow nerds. Machines: The Original DIY and the Cannon are the same as the units we are shipping from Smart Air. The Blue Air was the 270E model. The Philips was the AC4072. 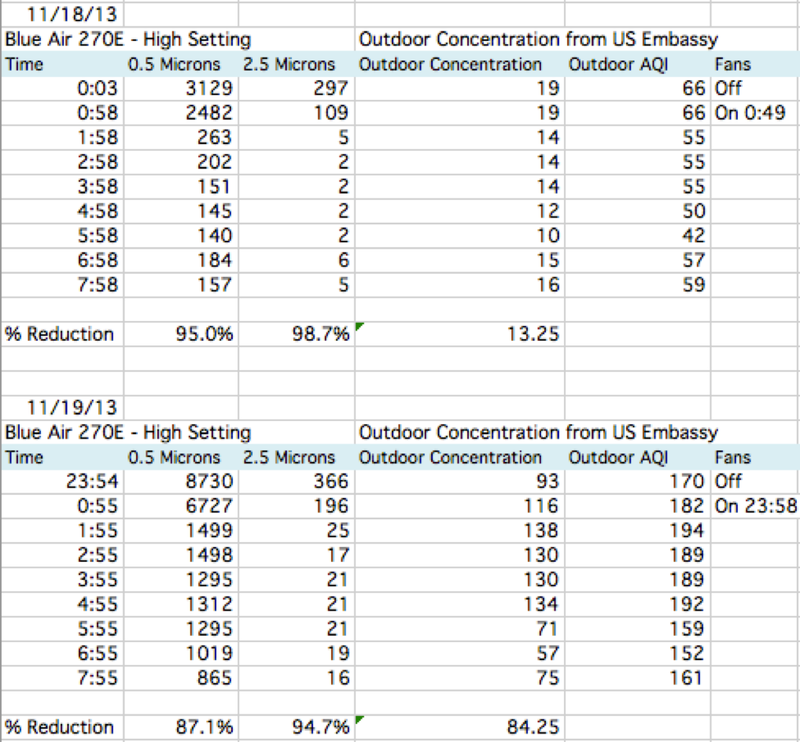 Calculating effectiveness: As always (1,2), to calculate effectiveness, I average the particle counts for the last four hours and divide that by the baseline number. 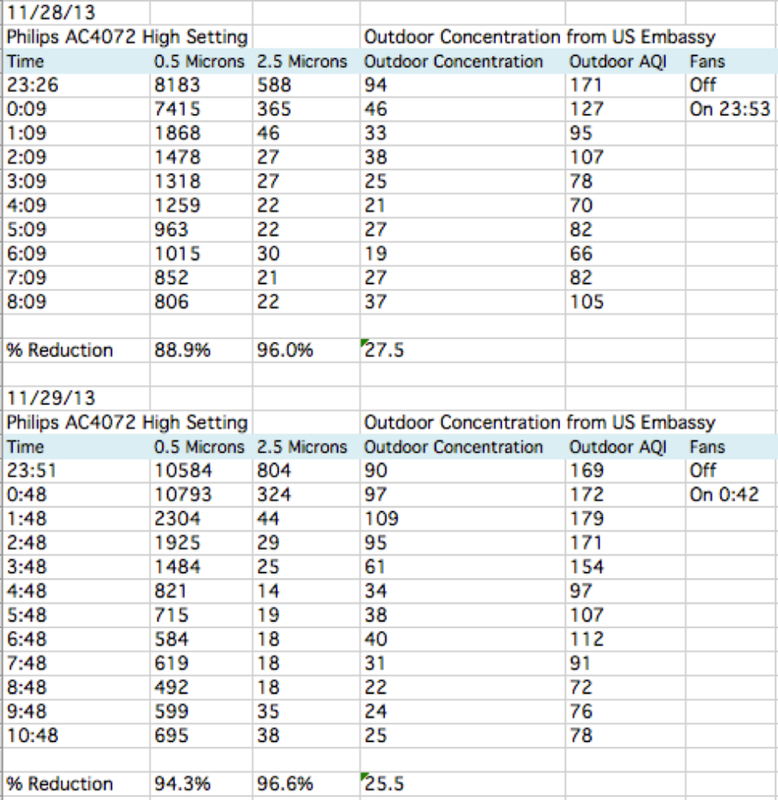 As I’ve said before, I think this method of calculating effectiveness is more rigorous than calculating the reduction versus outside because indoor air is cleaner than outdoor air. Sample timing: Anna took the baseline measurement before she went to bed. Then she set the particle counter to take hourly measurements until she woke up in the morning. Filter Life: The owner of the Philips estimated it had been used previously for a few weeks. The owner of the Blueair estimated the current filters had been used for approximately 6 months, which means it was about time to replace the filters. Interpreting the speed of the drop: The time between (1) turning the filter on and (2) the nearest hourly measurement varies a lot based on when Anna took the baseline measurement and when she set the particle counter into hourly mode. 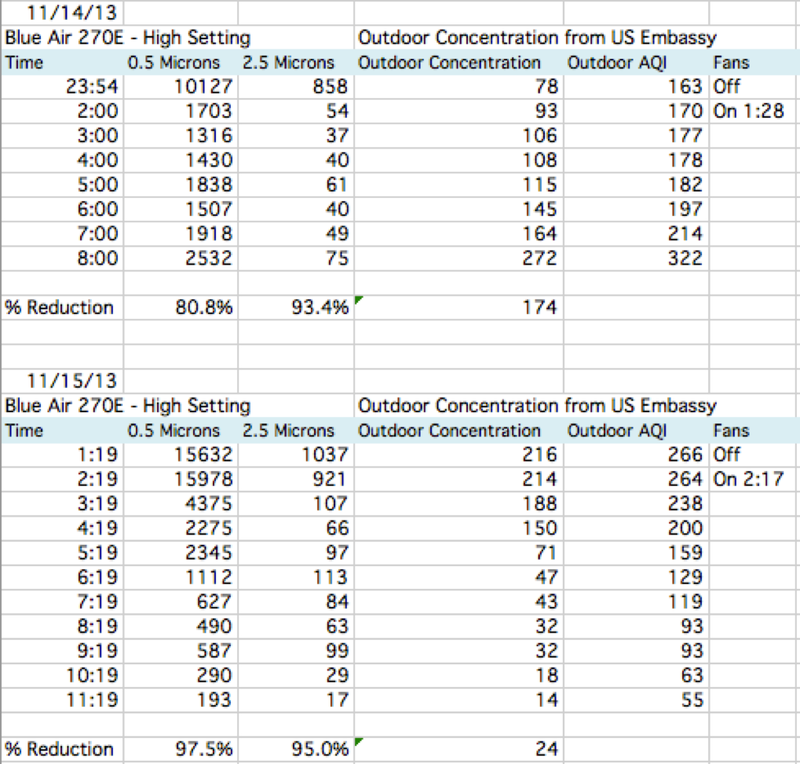 Therefore, it’s difficult to compare how fast the particulates went down. 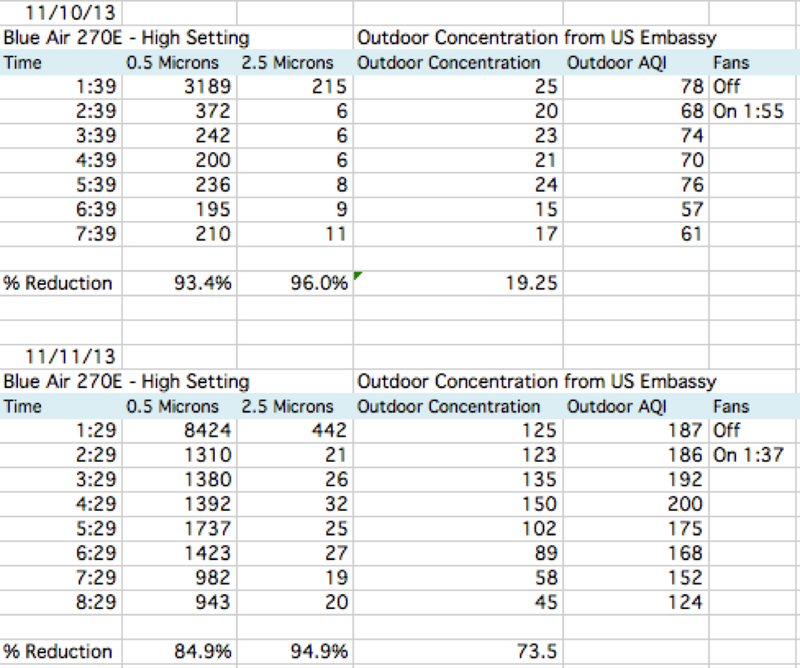 If you want to try and compare the speed of the drop in particulates in the first few hours, you’ll have to note the time that the filter was turned on (in the far right column). 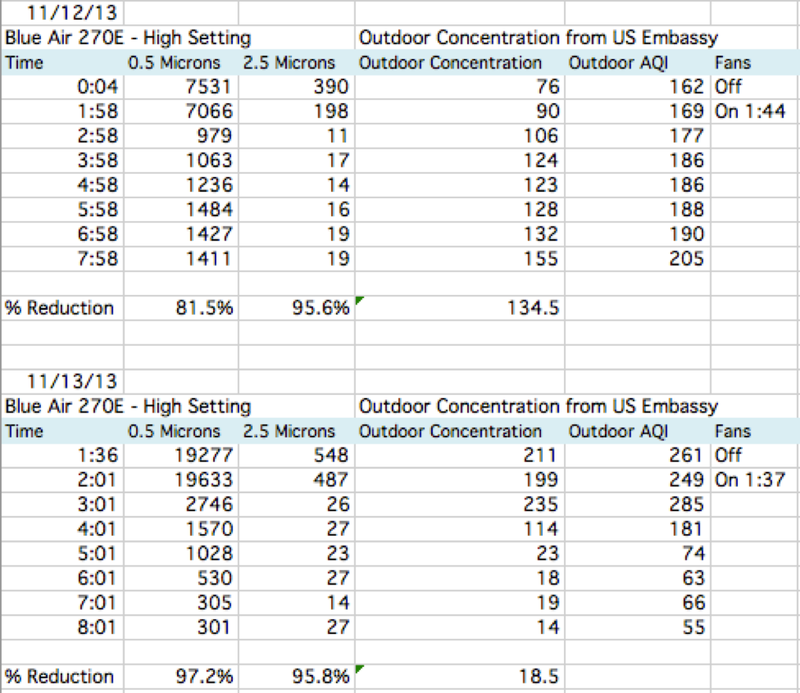 However, for speed comparisons, I think our controlled tests are much more useful (here’s an example). I’ll post more of those in the future. 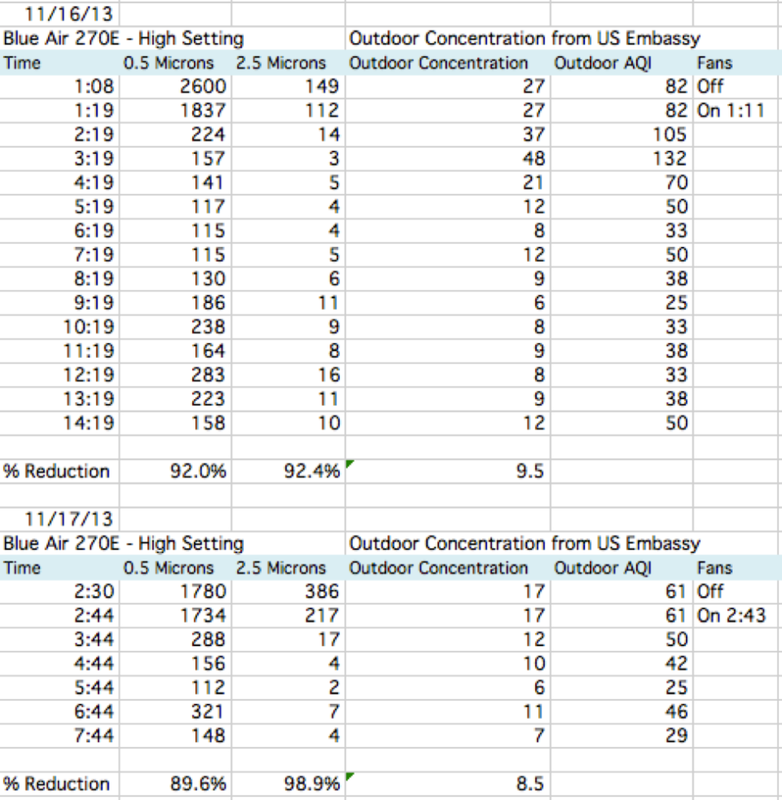 Note that the outdoor air during these 11 tests was variable–more variable than I’d like. 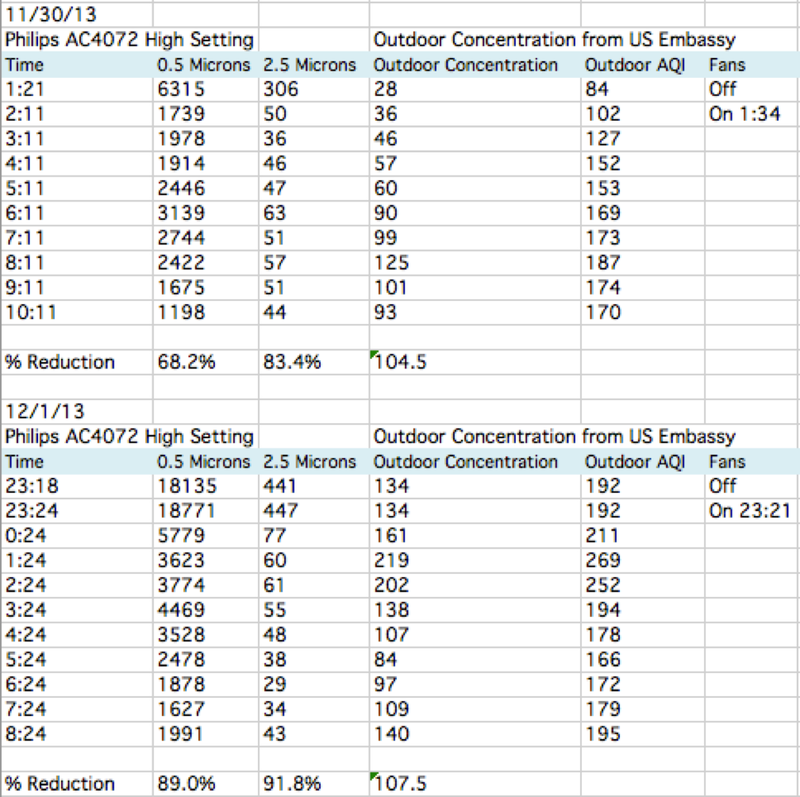 Ideally, the outdoor air would remain relatively stable. To analyze whether outside fluctuations affected the results, I re-calculated effectiveness by looking only at the 5 days where the outside concentration did not change by more than 50 micrograms from baseline. 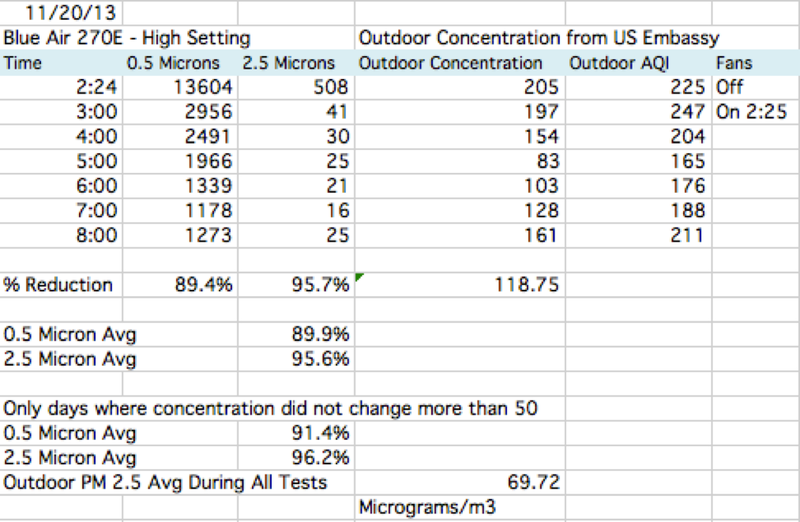 However, that gave nearly identical numbers for average effectiveness: 91% of 0.5 microns and 96% of 2.5 microns (versus 90% and 96% over all 11 tests). Therefore, I’m confident that outdoor fluctuations did not significantly influence the estimation of effectiveness. 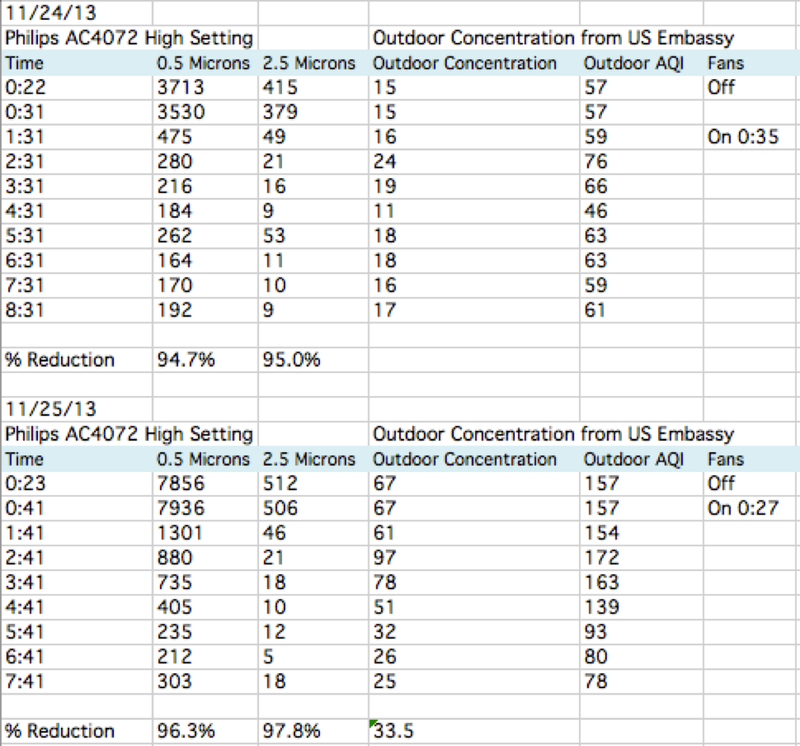 There was one outlier in the Philips data: the percent reduction was much lower on 11/30 (68% and 83%). This is probably because the outside concentration went from about 25 to 125 on that day–a fivefold increase. Thus, I removed this datapoint from my final calculation of effectiveness. However, you can see the calculation with that datapoint included above.